I took this picture in Iraq about four years ago. It shows British soldiers on patrol in Basra shortly before the British Armed Forces’ handover of Basra province to the Iraqis on 16 December 2007. I was in Iraq for about a week or so, and I got to know the soldiers as well as I could in that short space of time. You do get to know people slightly quicker in these sorts of situations. going through his mind. You could interpret the fact he is looking up to the light in lots of different ways, but ultimately I don’t know what’s going on in his head. Whatever he is thinking, it’s private. This personal moment could be indicative of the wider conflict – he could be anybody’s son, husband or brother. The soldier represents those moments experienced by many other servicemen and women – he is, in a way, everyman. It was really quiet in the vehicle at this time as nobody was talking. The soldiers and I would have been chatting beforehand – when we were being briefed before going out on patrol, for example – but right then it was silent. You are sharing an experience that not many members of the public will go through, so there is a kind of shared bond between you and the soldiers. This image asks a lot of questions and you couldn’t give a definitive meaning to it even if you wanted to. I was just trying to convey how daunting a task it was being a soldier in Iraq at the time. The soldier looks very pensive and I wanted to capture his expression. I like the way the light is falling on his face and that, although there are two people in the frame, you can only see one of their faces. The other soldier has his head down and is almost completely shrouded in shadow. You can surmise that both are deep in thought, perhaps thinking about home, or the patrol. As a photographer in a situation like this, lots of things are going through your own mind. I would have been concentrating on the technical side of creating the image, such as making sure the exposure was right. As I had already taken an exposure reading for the top of the helmet, I knew what the exposure would be so it was just a question of waiting for the soldier to look up. The vehicle was dark inside, making it difficult to take any shots at all. In addition, the terrain was very bumpy and rough – so not really conducive to taking photographs. 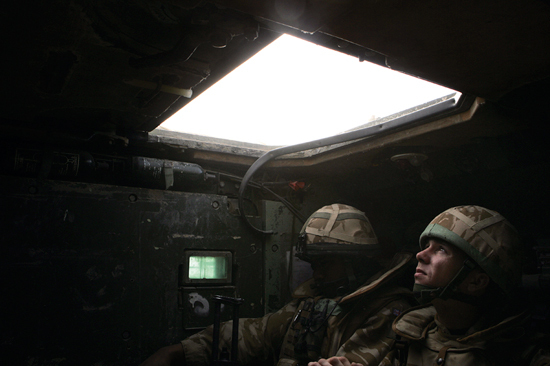 Whenever the soldier looked up towards the light, I took the opportunity to fire off a couple of frames. I took the minimum amount of equipment with me so I could travel light. I was wearing full body armour like the soldiers (although I wasn’t dressed in camouflage gear. I was using two Canon EOS-1D Mark II cameras, one with a 70-200mm lens attached and the other with a 16-35mm lens. I knew there wouldn’t be much room to manoeuvre inside the vehicle, so I’d purposefully taken my wideangle lens with me. As soon as you take the lens off your camera in a desert environment, dust gets onto the sensor. Consequently, you can’t change your lens when out on patrol. This goes for the entire duration of the tour because the dust is everywhere. The only solution is to leave the lenses on the cameras. It is my job to photograph what is in front of me as honestly as I can, but there has to be a sensitivity towards the subjects, too. There’s a fine line between trying to respect the soldiers’ feelings and their space, and recording what’s going on. Generally, the soldiers want people at home to know what is going on – to see what they are going through and how hard it can be. If you can get it across to the soldiers that you are there to record what’s happening and don’t have your own agenda, they are happy for you to be there. If they don’t want you taking their picture, they’ll soon let you know. These guys have other things to think about anyway, so they forget about you quite quickly. I generally like to fade into the background as much as possible so I can get on with my job. You have to work hard to capture the atmosphere in a still image of what it is like to be in a situation such as this. However, the power of the photograph remains – a single image can grab the attention of the viewer, perhaps more so than rolling news, which we can sometimes become desensitised to. People can look at a photograph in their own time, come back to it, ponder what it is they’re looking at and think about what the picture makes them feel. The viewer has more control over when and how they view that image.